Phuket Boatcharter offers a large variety of Sailing Yachts and Speedboat / Power Catamaran for a private Day Trip Charter. Rent your own boat for a great day out to discover the Islands around Phuket Thailand. 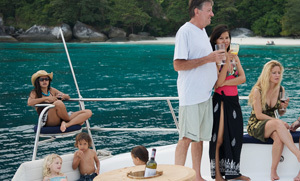 The Private Sailing Yachts usually cruise to Ko Mai Ton, Coral Island or Racha Yai Island. It depends on the wind and weather. With your own hired Speedboat or Power Catamaran you can disover Phang Nga Bay National Park, Phi Phi, Mai Ton or further destinations like Krabi. Unique for Phuket Day Trip: they come with many waters toys, like floating jacuzzi, water slide, flosting sofa etc. Rent your own private boat for a very Special Day Tour in Phuket. A day charter on a private sailing yacht with Phuket Boatcharter offers much more privacy, space and of course individual service. The Thai Buffet Lunch is freshly prepared by our Thai Chef after your taste. On the private day tours we offer snorkeling, fishing, kayaking. This is a fantastic day experience for families, groups of friends and to celebrate a special event in Phuket. Have a look at our sailing yachts based in Phuket. 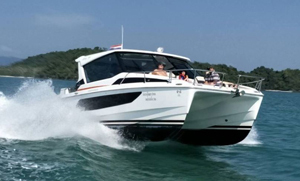 Rent your own Private Speedboat for a Daytrip in Phuket. Speed Boats from 36 - 51 ft. for groups for up to 20 guests. Very comfortable Boats with fantastic onboard service. The Power Catamarans come with many water toys to have excellent fun on your private Phuket Boat Tour. Have a look at your Day Trip Speedboats. You have a special occasion to celebrate in Phuket? Come aboard on one of our boats or yachts and celebrate an unforgetable party, memorable day. Being on a yacht offers you and your family and friends a lot of privacy - after all "you are all in the same boat". The atmosphere is very casual and our crew will take care of all your needs. We can organize this all for you for your big day in Phuket.